Do you know what I love the smell of? Fresh coffee beans… melted chocolate…fresh baked bread…and Roasted Garlic. 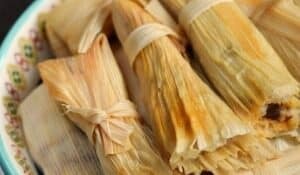 There’s just something about that sweet yet pungent smell wafting through the house, because you know that something delicious is going to be made with it. For us today, this is the first step towards what I hope is going to be…..
For now, we are going to delight in this super easy first step and keep our fingers crossed. 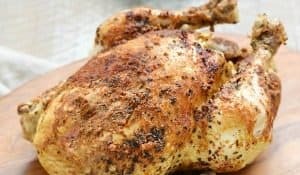 Start by preheating the oven to 350 degrees. Slice the top of the heads of garlic to reveal the cloves inside…..
There’s no right or wrong way to slice the garlic. 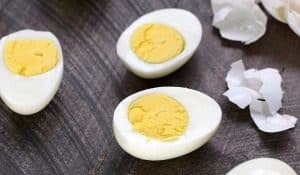 I have even sliced them in half and roasted all four halves together before, so you can’t mess up…trust me! Place the garlic on a sheet of aluminum foil and drizzle with olive oil…..
Gently fold up the sides of the foil and create a ball. It doesn’t have to be perfect, it just has to keep the heat inside…..
Place in the oven and bake for one hour. 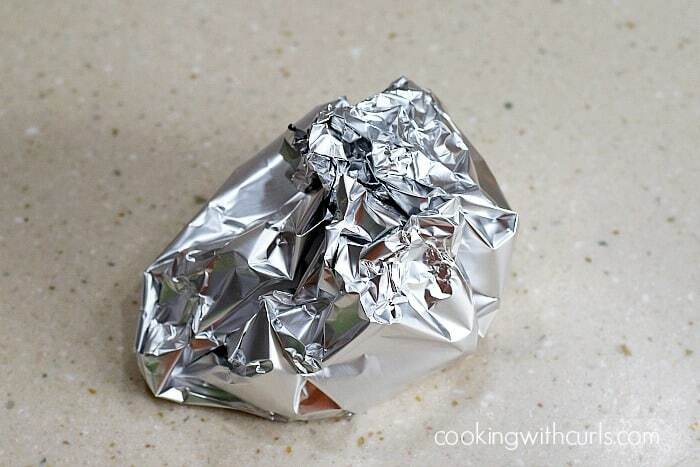 Remove from the oven and carefully open the foil to allow the heat to escape….. Allow to cool enough that you do not burn your fingers for the next step…oil is hot and it burns!! When the garlic is cool enough, no I do not listen to my own advice, squeeze each clove of garlic out of it’s paper shell….. 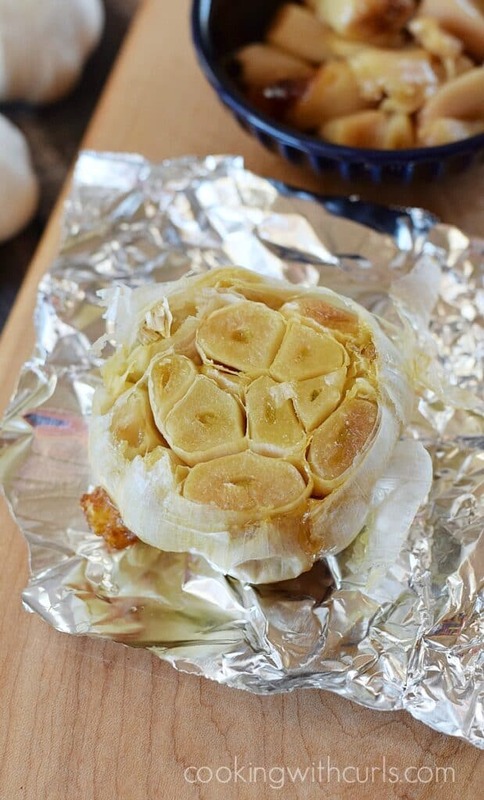 Cooking 101: Roasted Garlic - How to easily Roast Garlic in the Oven. 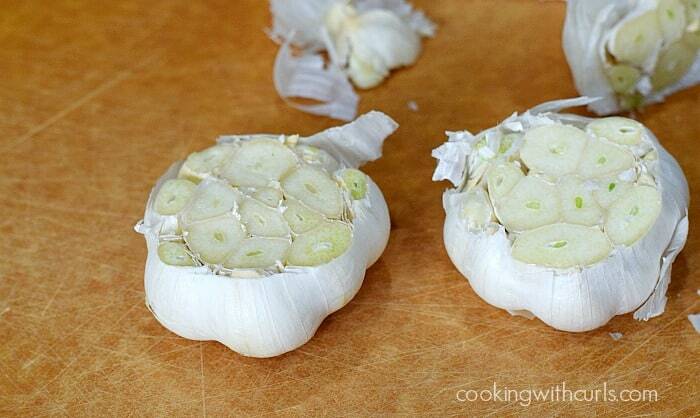 Slice the tops off of each head of garlic to reveal the cloves inside. 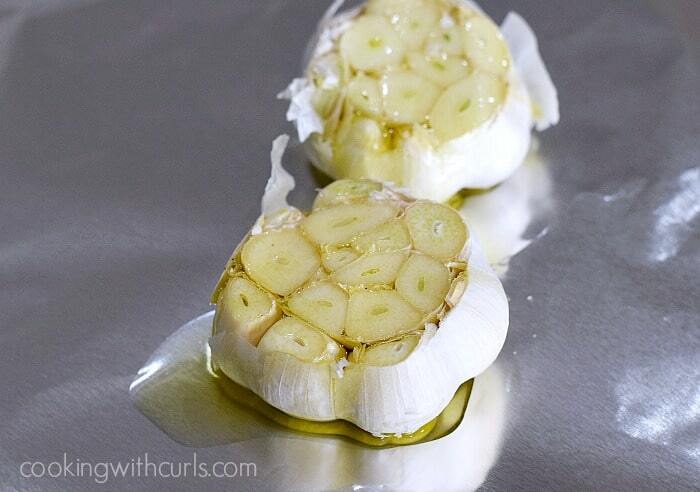 Set garlic on a large sheet of aluminium foil and drizzle with olive oil. 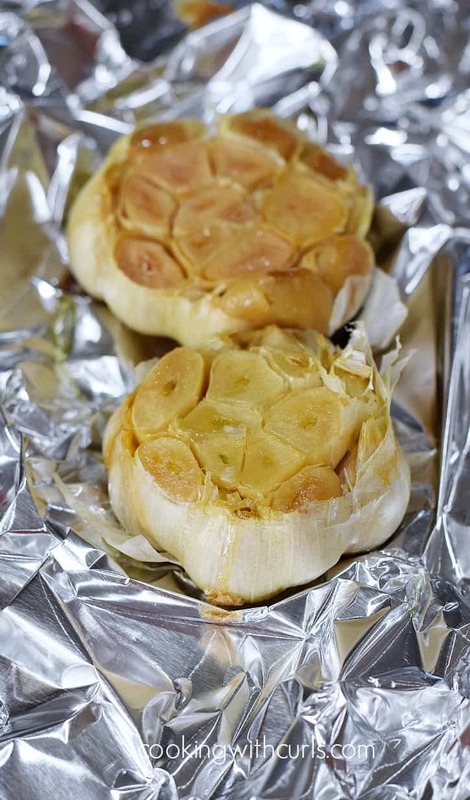 Fold the foil around the garlic and place in the preheated oven. Remove from oven and carefully open the foil to allow the heat to escape. Allow to cool enough to handle and squeeze each garlic clove out of the paper shell. 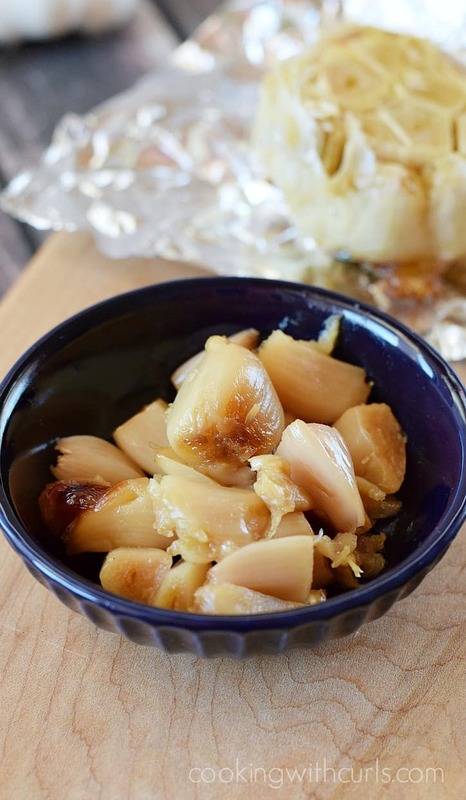 I’ve had roasted garlic at restaurants before – so delicious – and I’ve always wanted to try it myself. Thanks for giving me a great excuse to do so – thanks for sharing!